Turfco, Inc. is proud to introduce our newest division, All Backflow Services, Inc. As Florida’s oldest, most professional Backflow Services Team, we provide all services of establishing necessary cross-connection control programs including but not limited to installation, inspecting, testing, rebuilding and retrofitting all types of backflow devices. Our professional technicians are trained and licensed by the FW and PCOA. 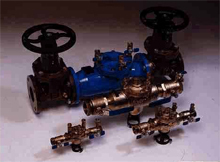 Each technician is fully trained to rebuild, replace, certify and test your backflow device and fire line preventers. We perform certification and repair services throughout the state of Florida and offer statewide contracts for companies with many different office or retail/commercial locations.